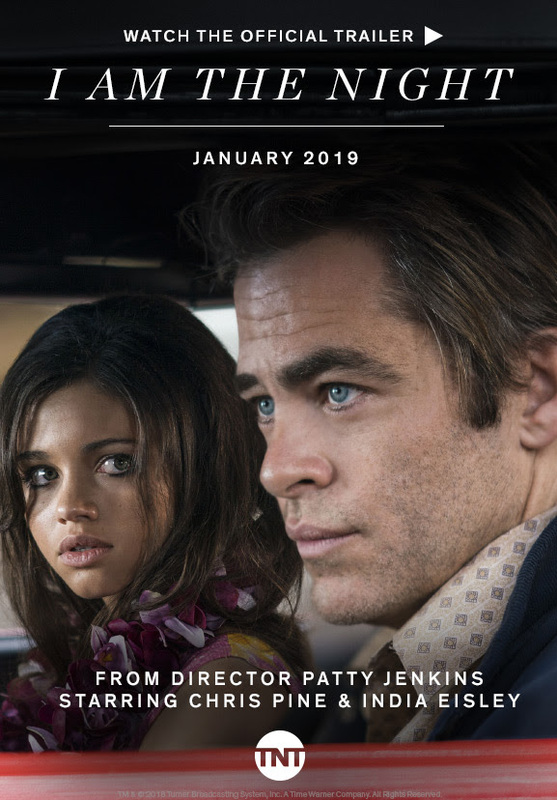 TNT has released the official trailer for the new limited series I Am the Night (formerly titled One Day She'll Darken) from executive producer and director Patty Jenkins (Wonder Woman, Monster). The newest installment in a thrilling collection of limited series called the TNT Suspense Collection™, the series stars Chris Pine, who also is an executive producer. The talented roster joining Pine includes India Eisley, Jefferson Mays, Leland Orser, Yul Vazquez, Dylan Smith, Golden Brooks, Justin Cornwell, Jay Paulson and Connie Nielsen. Sam Sheridan, author of A Fighter's Heart and The Disaster Diaries, wrote five of the six episodes, inspired by the life of Fauna Hodel. The series is produced by Turner's Studio T, with Jenkins, Anonymous Content and Sugar23’s Michael Sugar (13 Reasons Why, Spotlight), Pine, Sheridan and Carl Franklin, (House of Cards, Homeland) serving as executive producers, with Franklin also directing two episodes.